Cats are instinctively very territorial. They fight with other cats to protect their territory or to acquire more territory. As a result, fight wounds are common in cats. In cats, over 90% of infected wounds result from cat bites sustained during a fight with another cat. Dog, rat, and other rodent bites can occur but they are much less common. Fight wounds frequently result in infection that can make cats quite ill, especially if left untreated. Fight wounds are more common in male cats than females and are most frequent in intact (unneutered) males. Unneutered male cats are very territorial; they will defend an area around their home but continually try to expand the borders of their territory. The desire for more territory and the need to keep intruders out of their existing territory means that they are constantly fighting with other cats. In contrast, neutered male cats defend a smaller area of territory around their home. If another cat invades this territory, he will defend it by fighting. The frequency of fighting will depend on the number of cats in the neighborhood and particularly the presence of unneutered male cats. Female cats will also defend their territory by fighting with other cats. Neutering may reduce territorial fighting, but will not completely stop it. Confining the cat to your house, particularly at night when cat fights are most common, will reduce the number of bites your cat sustains. When a cat bites, its sharp canine teeth easily puncture the skin, leaving small, but deep, wounds in the skin. These punctures rapidly seal over, trapping bacteria from the cat's mouth under the skin of the victim, where they can readily multiply. The infection may go unnoticed for several days, until swelling and pain at the puncture site develop. At this point, the cat will often develop a fever. If the skin surrounding the wound is loose, a pocket of pus will develop, forming an abscess. In areas where the skin is not loose such as the lower leg or the tail, the infection spreads through the tissues and causes cellulitis. "These punctures rapidly seal over, trapping bacteria from the cat's mouth under the skin of the victim." In rare cases, a cat bite will result in septic arthritis (infection of a joint space), osteomyelitis (infection of bone), or pyothorax (the chest cavity fills with pus). 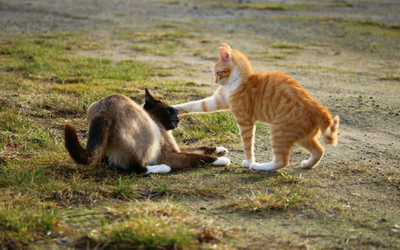 If you know that your cat has been in a fight, notify your veterinarian immediately. Antibiotics given within 24 hours will often stop the spread of infection and may prevent the development of an abscess. If several days have passed since the fight, an abscess will usually form, requiring more involved medical treatment. How will I know that my cat has a fight wound if I can't find any bite marks? Puncture wounds heal very quickly so there is often nothing to see or feel, especially in the first few days after the bite. It may be possible to feel heat and swelling in the area of the bite. The most common sites of bites are on the head, forelimbs, or at the base of the tail. If the leg was bitten, it is usually painful and the cat may limp. Some cats may just be lethargic and have a fever. Many cats will excessively groom the injured area. You should immediately take your cat to your veterinarian. If an abscess is present, your veterinarian will drain and flush the injured site. This may be done by removing the scabs over the original bite wounds or, more commonly, by lancing the skin over the abscess. It may be necessary to sedate or anesthetize your cat for this. If cellulitis is present, drainage is not possible. "If your veterinarian prescribes an antibiotic for you to give to your cat, it is very important that you give all the tablets as directed." Antibiotics (such as ampicillin, amoxicillin-clavulanate, cefazolin, or cefovecin) will be given to treat the bacterial infection. If your veterinarian prescribes antibiotic tablets for you to give to your cat, it is very important that you give all the tablets as directed. Pain medications, may also be prescribed. With large abscesses, your veterinarian may recommend a technique called debridement, or removal of all the affected tissues, including any inflamed tissues that have walled off the abscess from the rest of the body. The resulting clean wound will be closed with sutures. In some situations, your veterinarian may also place a surgical drain in the wound, to allow any discharges to escape. You need to clean the drainage holes twice a day for two to five days, or until the drain is removed. Once the tissues have completely healed, which usually takes about two weeks, any remaining sutures will be removed. How should I manage the wound after my veterinarian has treated it? If your veterinarian has drained the abscess, the wound may deliberately be left open to allow for drainage. It is advisable to clean the wound twice a day for two to three days to keep it open, using cotton balls, gauze, or a washcloth and warm water. If a skin cleanser or surgical soap is necessary, your veterinarian will prescribe it. Use only products that are recommended by your veterinarian. NEVER use disinfectants containing phenols because these are toxic to cats. Never use hydrogen peroxide for cleaning a drained abscess, since this will delay healing and can worsen the problem. With appropriate treatment, most abscesses should heal within five to seven days. The swelling associated with cellulitis may take longer. If you feel the wound is not healing normally, you should ask your veterinarian to examine it. If you do not have your cat treated, there is a danger that the abscess will burst and only partially drain before healing begins. This can leave small pockets of pus behind, which will cause recurrence. Similar consequences may follow if courses of antibiotics are not completed or adequate drainage is not maintained. "Certain viruses such as feline immunodeficiency virus (FIV) and feline leukemia virus (FeLV) suppress the immune system and may complicate the cat's recovery." If an infected wound does not heal within a few days, your veterinarian may want to do further tests to see if there is an underlying cause. Certain viruses such as feline immunodeficiency virus (FIV) and feline leukemia virus (FeLV) suppress the immune system and may complicate the cat's recovery from infection. Blood tests can be performed to diagnose these viral infections. A persistent draining wound may indicate that a foreign body such as a broken tooth, a claw, or some soil is present in the wound and may require surgical exploration. Alternatively, it may indicate the presence of an unusual infectious agent requiring biopsies for culture and other tests. This may reflect inadequate treatment as discussed in the question above where the abscess never completely resolves. Alternatively, it may reflect an individual cat's method of fighting; the cat that runs away will tend to be bitten on the tail base, whereas the aggressive attacking cat will tend to be bitten on the head or forelimbs. 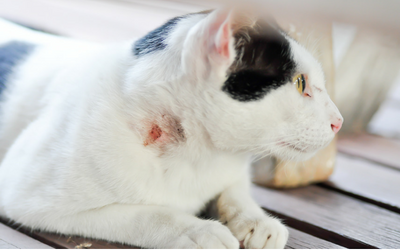 Bite wounds are the main route of transmission of some important feline infections, most notably, feline immunodeficiency virus (FIV) and feline leukemia virus (FeLV). Blood tests should be performed after any bite wounds to diagnose these infections.